If any of the following applies to you then you might want to book in for one of our training sessions. TrailBlazers has developed a Training Method which enables the trainee to acquire the necessary skills to competently control a motorcycle. Our group courses run for 2 weeks, 2.5 hour session each week. 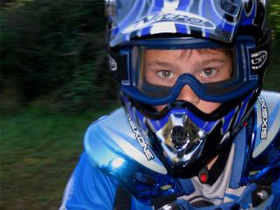 Kids 5-16, Groups age and skills based where possible, all equipment safety gear, bikes and instructors included. First lesson beginning with the basic skill’s familiarizing yourself with the bike, balance, posture, basic control, cornering, braking and acceleration. Following lessons will include more advanced skills such as gear changing, intermediate cornering, braking, accelerating. Finally putting all the skills together, riding competently and with confidence on a real bush trail. Why not bring a friend and book an instructor for an hour? 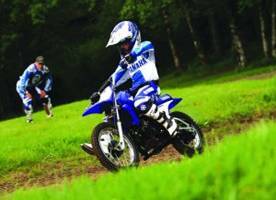 Learning the Basics 2.5 hrs Training Arena & Level 1 Trail Introduction to motorcycling covering safety & equipment, the motorcycle, throttle control, balance, posture, basic cornering, braking & acceleration. 2nd half of session progressing to more advanced skills such as gear changing, intermediate cornering, braking and accelerating. Recap & build on skills 2.5 hr Training Arena and Level 1, 2 & 3 Trails Revisit the basics & progress to more advanced skills such as Gear changing, intermediate cornering, braking & accelerating, hills & creek crossing. 2nd half of session, advanced cornering & balance skills, hill climbs. Putting skills together to competently & comfortably ride a bike on real bush trails.